Mmm it brings tears to the eyes that's for sure. We can get complacent about family, till it's taken away. After that there is nothing else to say but Bravo..
That photo is light a spectacular fireworks finale to me - all of the emotions attached to having left the war zone +plus all of the emotions for having left and been away from home +all of the emotions of returning home. I applaud it the same way I do a spectacular fireworks finale! Hi - yesterday's post made me laugh out loud and today's made me shed a tear...you are so eloquent in pointing out what so many of us pass by in the day to day. NOW, you're talking. Wonderful post. Off to hug my kids right now! What a lovely post. We have experienced many reunions like this. I always cry when I see one though. My dad was in the Navy when I was growing up (28 years) and I remember many days waiting dockside for my dad's ship to let the gangplank down. As many Army reunions as I've been to and participated in, to me there is nothing like a ship coming into port. They always compel me back to my childhood and the feeling of anticipation and excitement of knowing I'd be seeing my dad again. That is beautiful and touching...! Beautiful. Now excuse me, there's something in my eye. Ahem. hugging them extra every day never leads to bad things eh? A soldier is well aware of what and why they are doing what they are doing. THANKS TO YOU ALL and WELCOME HOME! That every day is a precious gift is a message that never gets old. Thanks for posting the photo--I had not seen it. Being raised in a military family, these scenes touch me. I agree with you completely. Beautiful post. I saw something similar on the news last week about soldiers who came home, National Guardsmen and women to just seeing their children after months away - some meeting for the first time (How heartbreaking is that?). Made me feel grateful for those men and women. My husband served six years in the U.S. Air Force and I was privileged to be a part of the military lifestyle. These are some of the most dedicated and courageous people you'll ever meet. Luckily Curtis and I never had to be separated for long, but we were the exception to the general rule. One of our neighbors' husbands, for example, hadn't been home for more than three or four months in the previous two YEARS. I couldn't imagine the impact then, and I still can't. It hurts me to be apart from my family for a week. I couldn't imagine what soldiers go through. S moving post and a compelling photo. So much emotion visible in that shot. I am sure you wrote a wonderful post but I am unable to read it at the moment :) because just looking at the photo has me so teary that I have mascara in the way. Pictures like that are like something squeezing the tears out of me. a wonderful pic that rings heavy with emotion. i spent 8 months apart from my fam once. i dont know how thy do it, but i am thankful. I was dumfounded when our son told us he had joined the army reserve (oh, mom, he says to me, we're not going to war) and the year he spent in Iraq (second tour) during the height of the bombings was easily the worst year of my life. You're trying to make me cry all Barbara Walters style, aren't ya? Beautiful post and amazing picture. I think it captures all the emotions you listed, and more. Those pictures always grip my heart. what an inspirational post to begin my day! you are so right on with all of your words, miss jennymac! Awww this makes me want to call everyone I know and tell them I love them!!!! And I haven't even been drinking!! I love that picture! It makes me sort of teary-eyed. I need a hug? I have a daughter in Chesapeake, VA, stationed there. She leaves for Haiti on Saturday. Oh, I love these types of pictures. So brave and such love! This is beautiful. That picture truly says a thousand words. At least. I can only imagine the joy building up in their hearts. The feeling is grateful, timid, tired, and most of all, relieved. When my husband returns from his deployments the ceremony room is filled with Kleenex boxes and cameras...kids and balloons...chaplains and captains. It's a wonderful feeling, seeing them home for the first time in 15 months. Thank you for your perspective...it feels good to know the sacrifices we, as military families, make are not lost on the rest of America. Incredible Picture! It actually brought a tear to my evil eyes! What a beautiful photo. My heart goes out to the families of the soldiers who are there making all our lives better.. Thank you for visiting my blog! Yours is BEAUTIFUL, and I think you're a terrific writer! I am a fan! Wow - that is a truly precious photo. That God we have such brave soldiers that continue to fight for our freedom. I too am gratefull to the men and women who give their lives for my freedom. I cannot imagine what it would be like to leave my family behind. Beautiful post... I share your sentiments. BTW... If you want your banner to fit complete on your page, just reduce it to 912 by 320 pixels. As much as I appreciate being away from my kids while on vacation with Hubby for a few days, I can NOT imagine not seeing my kids daily....watching them grow, learn, change. How do these people do it? We are so blessed. I think about this same thing all the time. I am so torn up about it. B/c we need people in the armed forces but I am just glad its not my family. During the beginning of our relationship, Jeff wanted to go into the reserves. I was supportive but secretly I hoped he would change his mind. He did. "I am hugging my family extra well today." The picture says so much without words. 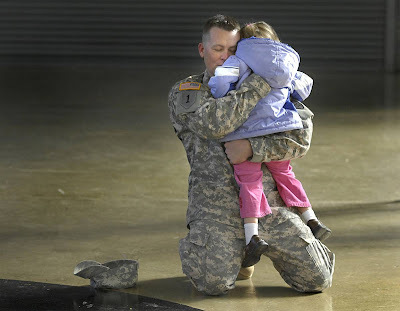 The closed eyes of the soldier hugging his little girl shows dozens of emotions - the most powerful one being perhaps thankfullness. Or maybe love. Thanks JennyMac - this kind of beautiful post shows how your soul shines brightly. Wow. How can you put what your thinking into such beautiful words? You totally captured the feeling of the picture and we, as readers, understand fully how YOU are feeling. It's a gift JM, a gift. I do not agree with war, but I do certainly have tremendous respect for people who believe in something so strongly that they are willing to risk their lives for it. I can never get over that. Kudos to you for sending out the reminder that as Americans we can sit here to freely blog, without censorship, and without worrying who might take over our home or possessions. Running errands is as easy as pie for most of us. We can pick our own jobs, leave them when we want, etc etc. All while soldiers are sacrificing moments just like those for all of our well-being, not just their immediate loved ones. I'm sure there were truly thousands of words flitting through his mind as he hugged his precious child; or maybe one word in his vocabulary that summed them all up. Either way, great post. That picture is so sweet! I cry every time a new batch of soldiers come home and they show their reunions on TV. I live near an air force base. It is a very compelling picture. Bless their hearts, I wonder if she even remembers him very well. Nine months is a very long time when you're three years old. I hope they go home and get right back to a wonderful life. I love the photo - it's amazing. And it brings tears to my eyes, which I think it might a lot of people. My husband got ut of the Army after almost 8 years in Oct '08, and luckily I only went through one deployment with him (he had one prior to our marriage). Saying goodbye was heart breaking (especially since we'd only been married less than a year) - I still think about it , and how it could have been the last time I saw him. The homecoming wasn't as big as some of the places we've seen (like Fort Hood when we lived there), but since it was just our small EOD unit with about 20 people, it was mor intimate. I remember them all coming off that bus - how I wish I had someone there to take pictures of it. I agree...those pictures are moving. Fantastic post! Just yesterday, my husband informed me that my oldest told him if this latest job didn't work out, he was going to join the militay. I couldn't be a prouder mama. Such a very selfless, and worthy thing to do. Even better when someone recognizes and makes the time to point it out. I'm sorry, I just skipped the words after the photo so I could say how moved I was by it. Whenever I see a photo or news story with the families welcoming home their loved ones from overseas...I get chocked up. I have friends in the Marines and think about them often as they get deployed. I am thankful for their service and bravery...while I sit home in my socks watching Biggest Loser. I know exactly what you mean. I get heart-sick for my kids even when they spend the weekend at my mom's. Sometimes I think that I NEVER want them to leave home- even for college. I can only imagine the kind of sacrifice our soldiers make. this reminds me of me when my daddy came home from the persian gulf war when i was a little one. I can remember that feeling like it was yesterday. I can't even imagine having to send a loved one off to a battle zone. It's hard enough sending Vlad down the road 65 miles to college! I have goosebumps, and I'm all teary eyed now. Beautiful photo. Thank you for this post. I think everyone needs reminders like this! Great piece. Hard to not see the photo and shed a tear or twelve. What those sacrifice is truly remarkable. We are so far away from our families but at least we can get on a plane where those in the military don't have that luxury to do as they please. Great writing Jenny! I'll be hugging my family extra well today, too :). Thank you for this, JennyMac, and blessings to our soldiers! I forgot to tell you I fixed my email link in my profile :)! Thanks for pointing that out, and sorry you couldn't reach me. Please stalk/email away! I just started crying seeing that picture and reading this! One of my good friends husband gets home from Iraq today and gets to see his 1 year old daughter! Great post JennyMac! I've been through it, and its not easy.I'm glad to be home! I think that picture says all those things! It reminds me just how lucky I am. That picture is sweet but sad...we should all feel so bless to have men that give up so much for us shouldn't we? Pictures like that or stories about those homecomings on the news always make me cry! Very well said! Think about how many people serving over seas have never even seen their own children at all! Great picture!!! I wish that the media would portray more of the happy things - along with the reality of war that they seem to dwell on! You have arrived, Jenny Mac. You have 1000+ followers! Congrats! This was an especially touching post. I love photographs that tell stories like this one. We are all so lucky and need to remind ourselves daily of all the ways we are blessed. Nice to be reminded of these things eh. "my dear sweet daughter, this is all for you"
Oh my that's a good one. I can't stop looking at his face. This was really sweet -- and thought provoking. What does it say about me that my mom was finally glad to have an empty nest? I never heard anything about a void in our home when I left for college. In fact, she helped me carry my stuff to my room until we got to the last load and drove home (3 hour drive) while I took the last of my things in to the building! What a powerful picture. Sure makes you think. What a very sweet photo and a well-written post! Bravo! What a beautifully written post. You know before I married my husband (who is ex-military) I had little respect for the armed forces at all. I felt like it was a ridiculous idea that we needed all these wars and that the people out there fighting them must be a bunch of knuckleheads too. But then I met my husband, who is not a knucklehead. He is smart and loving and kind. And he isn't for mindless war. But he joined the military at 17 to get out, if you know what I mean. From a bad family situation among other things. This is the story of so many young soldiers. They are not jerks or morons, just kids trying to make a life for themselves any way they can. And for whatever reason over the years I have also grown to respect that some soldiers really believe in what they are doing too, even if all the violence is misguided. Anyhoo. I really loved this post. You are an extremely talented and awesome writer. i tear up every time i see pics or videos of this nature. being the girlfriend of an ex-military man (we met after he returned from over seas), i can not imagine having to go through this. i am extra thankful for everything i have everyday, and even more thankful that we have brave men like these who sacrifice time with their loved ones to serve our country, something many of us take for granted. This picture is priceless! Stopping from SITS! This is a great post and just brought a tear to my eye. What an amazing and emotional photograph. i have no words. but thank you is in order. Thank you for posting this JennyMac. Sometimes it takes a picture to remind us of what is really important in life. Sometimes we lose sight of this, and this is a beautiful reminder. Beautiful post and such a heartwarming photo....It definitely makes you want to just hug the daylights out of everyone in your family and be grateful. I love this post. Thank you for putting into words the way so many of us feel! That is beautiful and makes me feel patriotic. Beautiful post JennyMac. Love it. The photo is amazing and it makes me so thankful to be me. That picture made me cry. Okay? It really, really did. Beautiful. Just beautiful. What this photo says to me is that both are thankful to be back together, that they've dreamt about this moment for a long time and wondered if it would ever come. I come from a long line of military men and married one (at the end of his military career so I didn't have to live this). There is always that question if we will see them again. I'm thankful that I've not lost any of my family in war but am proud for the freedom they purchase for others. This picture is so beautiful. It spoke to my heart. So awesome, and so true.